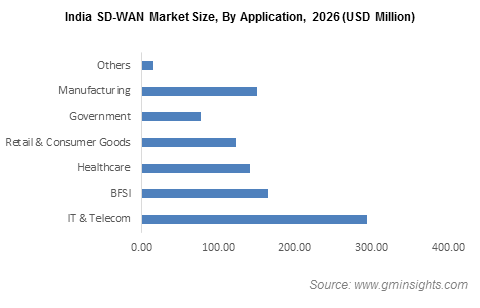 SD-WAN Market size estimated at over USD 700 million in 2018, growing at a CAGR of 58% from 2019 to 2025. SD-WAN market growth is driven by the rising need among organizations to reduce the complexity of their WAN infrastructure. The growing popularity of trends such as Bring Your Own Device (BYOD) and the IoT has increased the complexity of enterprise networks, This will drive the need for SD-WAN solutions, providing requisite support to manage these networks and also allowing granular visibility into the network activity to ensure security. Thus, the acceleration of the mobile data traffic has driven the demand for the technology to provide network administrators real-time insights for the control & management of network traffic. The market is also driven by the growing adoption of network virtualization technology, which will enable organizations to scale their networking infrastructure in response to workloads by using cloud computing. This will also help them to integrate their disparate network resources into their overall IT operations in a better manner. Another factor contributing to market growth is the rising popularity of 5G networks. The technology is expected to support further SD-WAN adoption as it offers high bandwidth and low latency in locations, where a fixed-line operator may not be available. The rollout of 5G networks will raise the need for solutions to handle the massive network traffic. To handle this, various small cells known as base stations are installed to provide customers with reliable & fast connectivity. As these small cells are critical to the 5G deployment, the network operators will need SD-WAN solutions to get the most out of the small-cell powered 5G networks. SD-WAN solutions will bring improved support to wireless technology by allowing the efficient allocation of network services to satisfy users’ demands. The virtual appliance segment in the SD-WAN market is expected to grow at a CAGR of over 70% over the forecast period. The market growth is driven by an increase in the adoption of network virtualization technology. 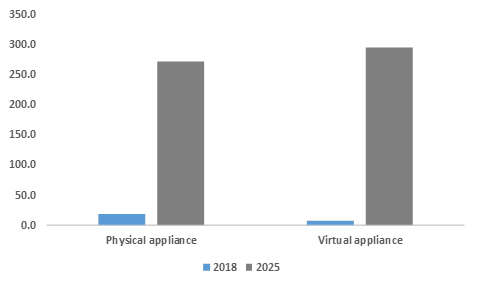 The demand for these appliances is expected to accelerate as enterprises want to skip the implementation complexities of hardware appliances. To meet the demands of workforce mobility and business-critical applications, the organizations deploy virtual appliances that enable them to launch virtualized network services and help in WAN optimization. Integration and maintenance services held the majority of the market share with over 44% in 2018. As SD-WAN technologies combine various physical WAN links, organizations face difficulties while integrating SD-WAN into their existing WAN infrastructure, which includes routers, firewalls, and network security elements. This will drive the demand for integration services, which will facilitate the smooth integration of new devices at the existing branch locations and consolidate disparate products & applications, and also reduce the IT complexity. 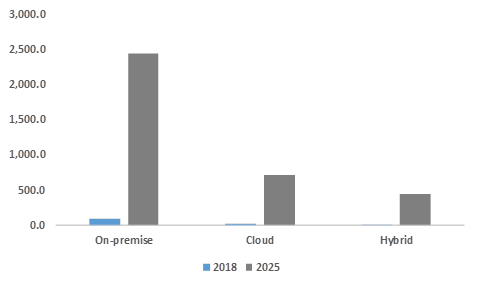 The hybrid cloud deployment model in the SD-WAN market is expected to witness the highest growth rate as it provides enterprises with liberty to use cloud resources and to test new capabilities in-house in a high-performance environment. The hybrid deployment model enables enterprises to deploy on-premise cloud to host critical workloads, making use of the third-party public cloud to host less-critical resources, acting as a viable option for enterprises, which will utilize the benefits of both. The IT & Telecom segment dominated the SD-WAN market with a share of over 30% in 2018. The penetration of smartphones has resulted in an increase in the use of bandwidth-intensive applications. This has put a strain on telecom operators that face inflexible MPLS bandwidth constraints. To address this, they are deploying cloud-enabled SD-WAN solutions, which allow them to take advantage of broadband to provide high-quality services. For instance, in November 2018, Versa Networks in partnership with BringCom deployed SD-WAN services in the East and West Africa. Under the partnership, Versa’s SD-WAN capabilities were integrated into BringCom’s offerings to provide customers with access to SD-WAN and cloud services. Furthermore, as IT firms are expanding their business operations globally and moving to cloud platforms, the demand for a robust & secure WAN architecture to achieve high connectivity and improve the network performance will increase. The rising demand among enterprises to manage their network assets to easily monitor their network performance will support multi-vendor IT environments and help in gaining complete control over their networks, driving the demand for SD-WAN solutions. The North America SD-WAN market is projected to hold a major market share of over 40% in 2025. The market growth in the region is driven by the growing adoption of cloud computing platforms and extensive usage of bandwidth-intensive applications driven by smartphone penetration. This drives the adoption of SD-WAN solutions, which will provide flexibility to prioritize the data traffic to support unified communications applications. Also, the growing trend of workforce mobility in the region also presents challenges related to providing remote access to corporate networks. This will drive the demand for SD-WAN, which will help enterprises to connect to remote users and networks in a cost-effective manner. The SD-WAN market is expected to witness an intense competition as the companies will focus more on product innovations, improvements in security, routing, and management functionality. For instance, in October 2018, Huawei launched next-generation SD-WAN routers, which use a unified platform and integrate branch services such as routing, firewall, voice, and Wi-Fi to simplify service deployment. Some of the companies, including Cisco and VMWare have adopted strategies such as acquisitions and new product developments to strengthen their leadership in the market. For instance, in December 2017, VMWare acquired VeloCloud for USD 610 million. With this acquisition, VMWare integrated VeloCloud SD-WAN into its product suite and strengthened its position as a leader in the SD-WAN market. The communication services providers are also entering into strategic partnerships with cloud service providers to leverage cloud capabilities to deliver new services. For instance, in September 2018, Epsilon partnered with Cato Networks to expand its global SD-WAN capabilities. Under the partnership, Epsilon offered high-performance cloud-based SD-WAN services that help to improve network performance and security. 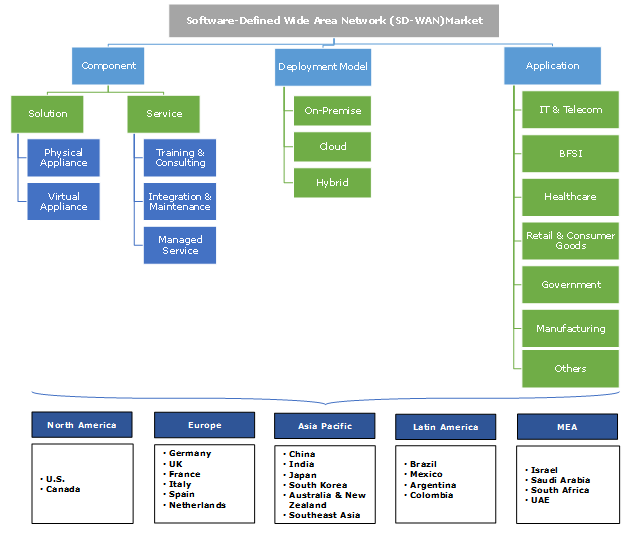 Some of the major companies operating in the SD-WAN market are Aryaka Networks, Inc., Barracuda Networks, Inc., Berkshire Partners LLC (Masergy Communications), Cato Networks, Cisco Systems, Inc., Citrix Systems, Inc., CloudGenix Inc., Ecessa Corporation, Elfiq Networks, FatPipe Networks Inc., Huawei Technologies Co., Ltd., Infovista, Nuage Networks, Oracle Corporation, Peplink, Riverbed Technology, Inc., Silver Peak, Versa Networks, Vmware, Inc., and ZTE Corporation. Enterprises have been dependent on WAN to connect their remote offices and devices. To ensure high connectivity to remote locations, they had to invest a significant amount in their WAN infrastructure. The rising popularity of virtualization has increased network complexity, making it difficult for traditional WANs to provide the required speed and high connectivity. Thus, SD-WAN acts as a cost-effective solution to meet the requisite demands of modern enterprise networks. The adoption of SD-WAN technology enables them to pay for the functionalities they require, reducing their CAPEX costs. Also, the use of AI and machine learning algorithms will foster the SD-WAN adoption as these technologies are widely used for WAN optimization, enabling network administrators to analyze the WAN traffic and automatically re-route the traffic for the selected connection.